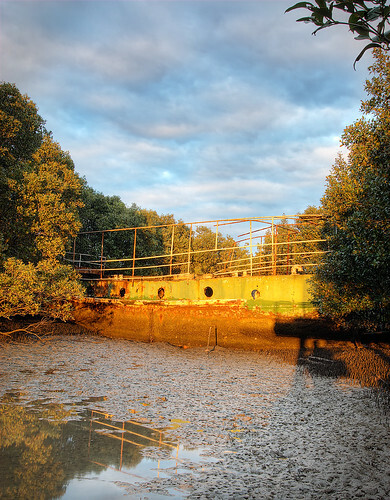 I’m amazed at how many people view my pictures of the Homebush Bay ship wrecks and make the same comment… “Wow… I never knew there were any wrecks like this in Sydney”. Well these wrecks are easy to photograph and can be quite rewarding. There are two main wrecks that are easy to photograph and a couple of other smaller wrecks that are a bit harder to get to…. I will describe the two main wrecks here. 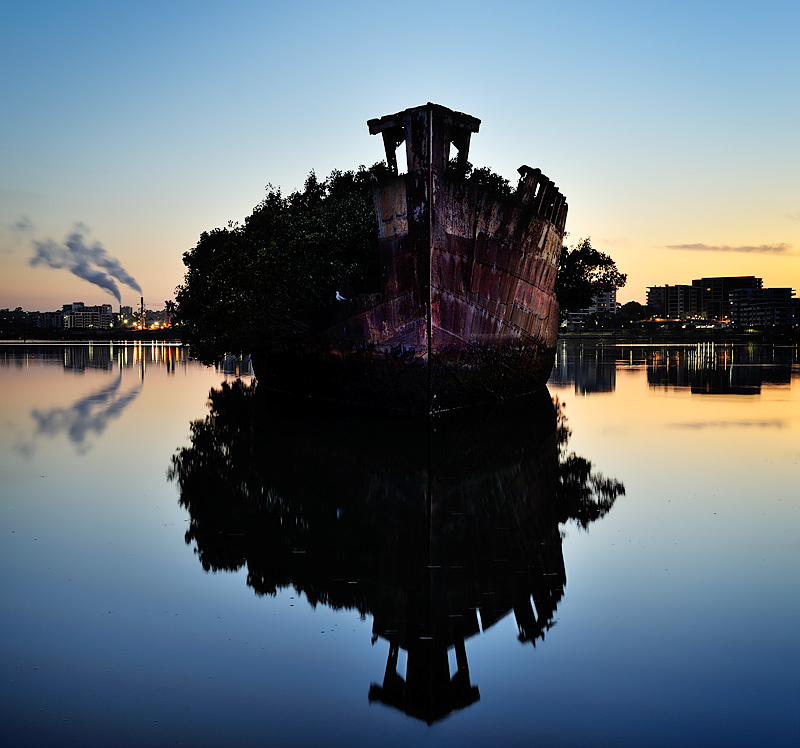 This is probably the most photographic wreck because it is surrounded by water and lies due East from the land (making it a good sunrise subject). If you want to get really close to the wreck at low tide I would advise you to wear gum boots if you are planning to get down in amongst the mangroves for some shots. Otherwise you can get some good angles from the rocks by the side of the water. You can easily miss this shipwreck if you don’t know it is there… you need to take the little path off to the shipwrecks and almost do a 180 degree turn to see this wreck…. It lies nestled in the mangroves facing due West. When the sun rises over the buildings in Rhodes, the golden light can really make this wreck come alive. There are some good shots if you climb down underneath the handrail, but be careful it is very muddy down in there. 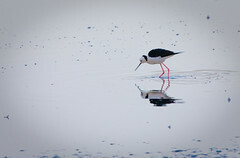 A short 100 metre walk further down the path will take you to a lovely bird wetlands reserve… there is a hide that you can use to photograph the birds and it is quite photogenic. Personally I’m not into wildlife, so I can’t tell you what type of birds you can find there. There is a lot of stray light from the apartment blocks nearby, so the main wreck is not suitable for those wishing to do long exposure night photography, however you might have better luck shooting the wreck against the mangroves. I’d bring gum boots if you are planning to get down in the mangroves, and a towell to clean your gear afterwards. Grad NDs are useful for shooting the main wreck as it will be against a bright sky. OK… You can shoot the wrecks at any tide, however if you want to get close to the main wreck then you should look for a very low tide. Wind isn’t really a factor for this site. Best place to park is in the carpark at the Archery center. To get to the main wreck you follow the path along the side of the block of flats. The second shot is a beauty. Great guide! — I went out there with a few mates last weekend. Thanks for submitting the guide! I went there yesterday, and took a few pictures, there are good, but not as good as yours. can you tell me how to make water look like a mirror? your pictures are really nice. Many thanks for the guide. It was incredibly useful. I went there myself and took a few shots. A couple of links to the images. Awesome pictures — Thank you so much for sharing these amazing pictures. I am just catching up on old business, by going back through my files and thanking people for the work they have done that I have used or been able to share with others. Hi Lee, these wrecks and others in Homebush bay were towed there by my father John Verren and his partners Bob Gillespie and John Sumner. These were not allowed to be towed out to see via Sydney harbour, due to the risk of foundering and blocking the shipping lanes through Sydney heads. Many came from Wollstonecraft Bay and White Bay, particularly the ship “Promyale” which was the boom defense ship that opened and closed the nets across the harbour in WWII. It was operating when the Japanese midget submarines followed a freighter into the harbour in wartime. Dad burnt many of the older wooden Sydney ferries in Kerosene Bay in wollstonecraft in 1965. He dived on most of the East coast Australian wrecks and was one of the finders of the Royal Shepherd off Sydney heads, which was originally brought to Australia by his own grandfather, William Snell Verren for the Van Deiman Steamship company in the 19th century. John Sumner is still alive and is living in Brisbane. He knows all the East coast wrecks in Australia. Alan Robinson knew all the West Australian wrecks and found the Batavia, Zeewick and Gilt Dragon in WA. He died without disclosing many other locations in WA after WA maritime fell out with him. 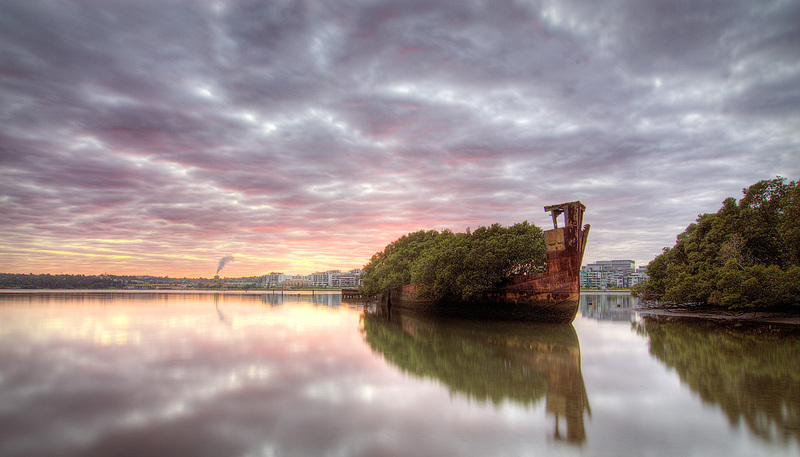 I used to see these wrecks at Berry Island in Wollstonecraft Bay in the 60s. Could you contact me please. This is very interesting. At the time of WW2 the vessel ‘Promyale’ was the ‘Myall’ owned by Allen Taylor & Co. Ltd., operating as a steam lighter in Sydney. She was renamed ‘Promyale’ when bought by Nicholson Bros Harbour Transport Pty Ltd in 1960. I had never seen any reference to her in her role in the defence of the harbour at the boom gate. Do you have any more details? Went to visit just on this review. Totally worth it. THANKS! Went and visited by looking at this site and would like to thank you for providing such a good guide. Here is John Byrnes of john dot mail at ozemail dot com dot at — interested to hear from you or anyone else interested. I compile history of Homebush Bay and its infilling and the place had some of the best/worst (depending on perspective) tips anywhere west of the City. * Exactly where were things once (tips … D’Arcy Wentworth’s home ‘Homebush’ , the many tips of the area .. etc. * What has become of the Maritime Services Board (and all its records). * Interesting things about people thereabouts (e.g. Mrs Love’s school for young ladies advertised as “Mrs Love’s school, Harmony House, Lovedale, Concord, opposite Kissing Point”. — (Last mistress of that [private] school moved to Burwood and founded a similar school there that was later bought out and became MLC (Methodist Ladies College, Burwood). I have written a story too on a vessel that never made it to HB for wrecking — “The Putney Submarine”. We think it was heading for HB when it stopped overnight on the downstream side of Ryde road bridge and something happened (thought that ‘kids pulled the bungs out’ and it sunk. It was later on cut up there. Kids thought it was a “Jap sub” but really it was the Dutch KX11 — one of the last vessels to flee the Japanese invading Dutch East Indies in WWII. jeanmay@activ8.net.au Hi John, Can you tell me anything else about Mrs Love’s school?